The metabolic test will outline your target heart rate zones, identify your fat burning rate at rest and target your zones where your body metabolizes the most fat. From there, our team will identify a program to burn more fat, increase endurance and perform at a higher rate for longer periods of time. Whether you’re looking to dramatically improve your level of performance or simply take off those last few pounds, we have the programs for you. By designing a workout, weight management and nutritional program specifically for you, our highly credentialed team can help you reach your peak potential through unmatched programming in physiology, nutrition, strength and conditioning and coaching. You will experience significant improvements in fitness, weight loss and overall performance. No matter your fitness level, our programs will help you achieve all your goals. The test will begin with a warm-up on the treadmill. 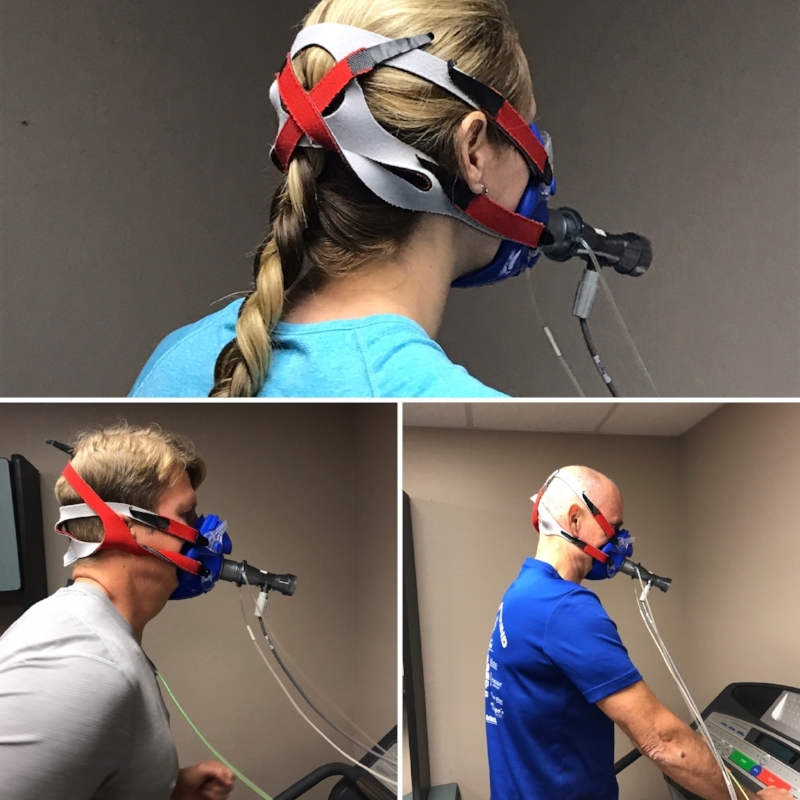 Once the warm-up is complete, a comfortable mask will be placed over your mouth and nose so that information regarding your gas exchange can be obtained by the metabolic cart. The treadmill will then begin moving at an easy, comfortable pace and will increase in speed every two minutes, up to a point that is slightly faster than your race pace speed. At this point, the incline will then be increased 1% every minute until the athlete feels unable to continue with the protocol. During this test our exercise physiologist will be monitoring the rate at which your body consumes oxygen, as well as your heart rate and rate of perceived exertion (RPE). The level of oxygen consumed will increase as the exercise intensity increases. After you have reached your peak level of oxygen consumption, a two minute cool-down period will begin to assess how quickly your cardiovascular system recovers. Total time for the test will be about 90 minutes, including time for warm-up, the running assessment, and an overview of the results. Using your individual bike, the test will begin with a warm-up on the CompuTrainer. Once the warm-up is complete, a comfortable mask will be placed over your mouth and nose so that information regarding your gas exchange can be obtained by the metabolic cart. Work on the CompuTrainer will then begin at a low and comfortable wattage for the first 5 minutes, and will increase in wattage every three minutes thereafter. During this time our exercise physiologist will be monitoring the rate in which your body consumes oxygen, as well as your heart rate and rate of perceived exertion (RPE). The level of oxygen consumed will increase as the exercise intensity (wattage on CompuTrainer) increases. After you have reached your peak level of oxygen consumption, a two minute cool-down period will begin to assess how quickly your cardiovascular system recovers. Total time for the test will be about 90 minutes, including time for warm-up, the cycling assessment, and an overview of the results.